The heart of our mission is land protection. 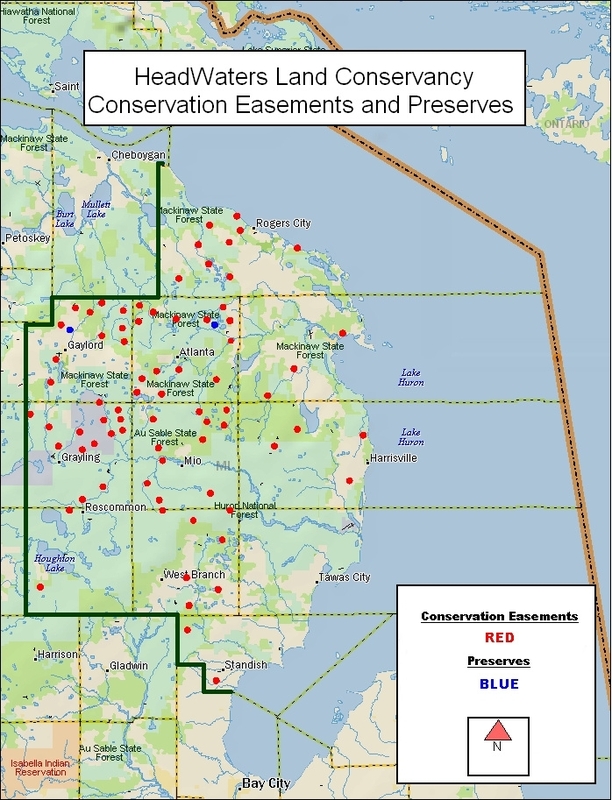 We’ve preserved over 10,000 acres, primarily through the use of conservation easements, and by helping create community conservation areas throughout northeast Michigan. While Michigan has many acres of land devoted to public parks and natural areas, there are countless places where development and other land uses threaten the quality of wildlife habitat or the purity of our waters. These are the farms, forests, natural shorelines and undeveloped properties owned by individuals and families that when protected, add value to the public lands that already serve us well. The purpose of Headwaters Land Conservancy is to help conserve the natural diversity and beauty of northern Michigan by protecting significant private land and scenic areas and fostering appreciation and understanding of the environment. What type of lands do we protect? Forests, grasslands, ponds, pine barrens, wetlands and ecologically sensitive areas that are important as wildlife habitat. Efforts to protect these areas help preserve water quality, provide waterfowl nesting habitat, stabilize shoreline areas, and support fish and other aquatic species. HeadWaters collaborates with private landowners to help preserve working forest lands and develop sustainable forestry management plans. HeadWaters preserves recreation lands for community enjoyment of low-impact, nature-based activities. The Sturgeon River Preserve is a great example of how we help create public community nature preserves. Open areas are important to many cities and towns, whether urban or rural. HeadWaters work to preserve these spaces for their natural, cultural, recreational and agricultural values. Park lands acquired by HWLC are often transferred to local governments to manage, or added to existing nature preserve areas. Scenic views along rural roads or highways in or near a community are part of our cultural heritage, and land trusts use various conservation methods to protect these areas for all to enjoy. Working farms, orchards and croplands also have a place in the conservation landscape. HeadWaters works to protect land and with significant productive value. Preservation: Directly protecting land through conservation easements, land acquisition and effective land management. Community Engagement: Helping to foster a culture of conservation, to support land conservation and funding, and to ensure that Michigan has highly-skilled and informed citizens.